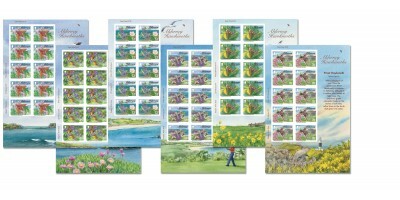 Beautifully illustrated by renowned international artist Petula Stone, our stamps feature the wonderful hawk-moths which can be seen in Alderney, from the busy little Hummingbird Hawk to the Privet and Poplar, which are common residents. 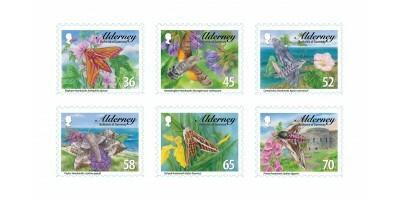 Complementing previous sets of stamps depicting Alderney’s wide range of insects, the Hawks are shown with island scenes in the background, although most of these moths fly at night. 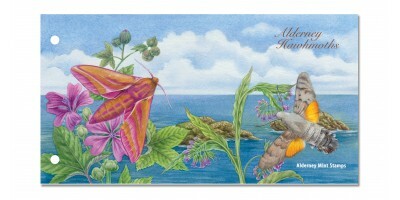 Hawk-moths are arguably some of the most spectacular of all moths and are the only ones capable of hovering, enabling them to use their long tongues to sip nectar from deep flowers. 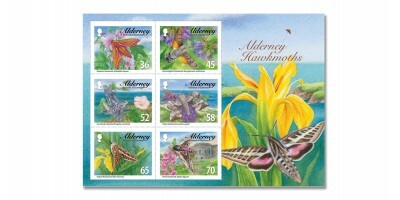 Their streamlined wings and bodies are perfectly adapted for rapid flight and indeed, some of the hawk-moths seen in Alderney have migrated hundreds of miles to reach the island. 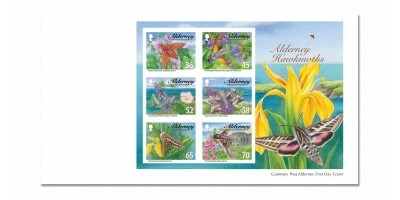 Species which reach Alderney from Africa include the rare and beautiful Striped Hawk and the huge, grey Convolvulus Hawk, which appears in autumn, sometimes commonly, where it hovers at dusk over long-tubed flowers. 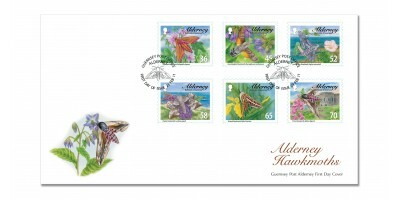 There are about 1,400 species of Hawk-moth around the world and some play a unique role in the pollination of plants: some orchids have evolved to be pollinated solely by hawk-moths - and if the moth becomes extinct, so too will the plants.